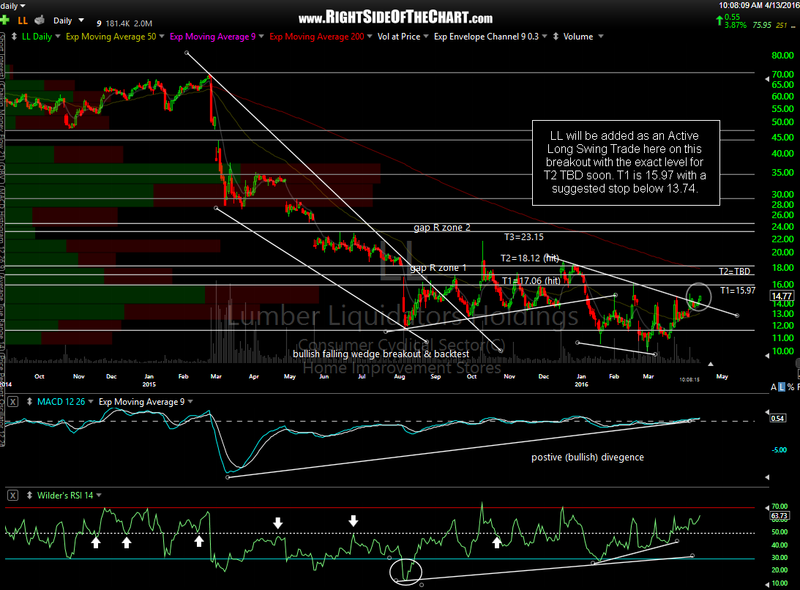 LL (Lumber Liquidators Holdings) will be added as an Active Long Swing Trade here on this breakout with the exact level for T2 TBD soon. T1 is 15.97 with a suggested stop below 13.74. G-luck pangblood. Just know that I’m betting against some big-wig hedge fund manager that recently took a big short position in LL although that’s never stopped me before. David vs. Goliath… let’s see if we can’t squeeze him out. I’ve learned quite recently that some hedge fund managers can be quite stubborn with their positions. like Bill Ackman, averaging down on his vrx position only to sink deeper into the mud. I don’t think this guy will let things go without a fight. Do you know how big his short position is? 1) Other than self-promotion, they only reason these guys talk to the press & release their holdings or publicly announce a position they claim to be taking is to talk up their book. Think about it; If you were going to take a big (institutionally big) position on a stock, who you be fool enough to announce to the world BEFORE you have actually already taken most or all of your position? Of course, as you go on CNBS or Faux Business News to talk up the position in order to help ramp the price up & help create the liquidity needed to exit your position. 2) Let’s just assume every big fund manager that takes his or her time to get dressed up, drive down to the studio & come in TV to let everyone in on his/her big secret is doing so solely for altruistic reasons.Then if they are already chock-full of that position, such as Tilson with LL as his biggest short, at that point they are a 100% guaranteed future seller (or in the case of a short position, a buyer) or a very large amount of that stock… guaranteed future demand (or supply)! just a casual observation here. every one of the last 6 spikes up in price have been followed with a retrace of at least .50, some .618, and one .736. these occurred over several days. seems to me LL has given pattern on each pull back. the volume today on this spike is not as intense as some of the others, so I see it as weaker, less conviction. the entry price is at overbought conditions (I understand the squeeze). I see a TL from may 7 2015 and price hit it today. I also see the 200dma still as resistance but weakening due to the near tag of april 5. just like the trade on MOS a few months back it seems to me there are better entries, such as 14.25 to 14.50 in several days from now after another consolidation event, upon achieving the 200 dma with some consolidation. finally, spy is into an overhead line of resistance after a big gap up, so not supportive. I will grant that LL almost always has moved counter market or market neutral and it has a great basing pattern. I simply prefer not to chase price here but rather a little lower with more pattern. I love it , good stuff rsotc! I fully agree with your take on all the public position disclosures and public talkers. And yes pangblood some of those HF managers have proven to be so dogmatic in their positioning it’s quite absurd really – they have really hurt their investors in a major way. I cannot believe some of these folks manage money at the scales they do. Yes they have been a winner in the past I realize but dogmatic views and positioning is no way to run money. It’s astonishing. For sure Its a good approach for those who are OK with higher risk of such an approach to bet relatively big on a carefully researched and convincing fundamental basis. Let’s face it that’s essentially what most HF’s try to do. But I wonder, do they even have anyone on their staffs who use even some basic technical analysis to help drive decisions and reverse their commitments at certain points on an objective basis no matter what their thematic convictions or fundamental justifications may be? I commented that I thought price here to be a bit extended and that some consolidation above the 200dma would be a better pattern for a long. it has done exactly that. I like counts of 7 so maybe one more day and this might move. unfortunately the pattern is not as clean as several bull flags in the past, so timing a break out is tougher. also the market has become more overbought making support of a break out less likely. LL has not participated in that move up while the market has gone up 2% in 6 days. price in the 6 days has not confirmed above the 200, so it could drop back to 14 on any distribution that may now begin if the market is topping. another unfortunate event is a move below 15 breaks a support TL going back to mid march. that would be a first warning to exit. time for this to move is tomorrow, imo. and watch for the weekly 50ma at 15.87. it has not been tagged for one year, so that zone should be resistance.